Following the signs for the historic downtown, I drove my cute rental car into Longmont, Colorado. It was exciting to spot Long's Peak, but I needed a chance to get oriented and find a restroom. When the sign for the library appeared, I knew it was a good omen. This is the delightful entrance to the Longmont Public Library, built in 1993. The figures are surveyors, sugar beet farmers, people of Longmont, and railroad trains from 1871-1910. Once inside, I found an even better surprise. 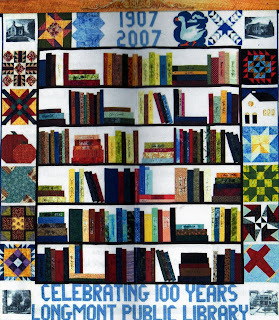 Hanging above the lobby was a bookshelf quilt made for the library's centennial in 2007. We worked with the same basic design to make last year's raffle quilt at my school. I don't have a photo of the finished product, only an early draft I made for the design. Our books were embroidered by students with their names. 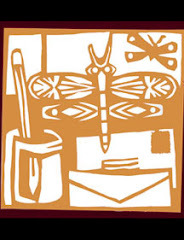 The Longmont quilt books had the signatures of Colorado authors. 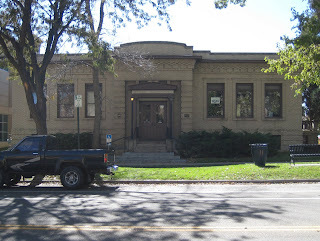 I parked the little blue Ford Focus rental car around the corner by the old Longmont Carnegie Library build in 1912. That building has a new life as the office for a cable access tv channel. The Pierce Carnegie Library in Nebraska where I spent so many childhood hours was built in 1911. I don't know how the Pierce preservation effort is going, or if the building has a new purpose. 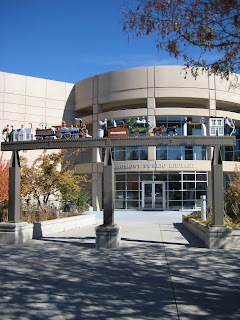 The Longmont Public Library brings my library life list to fifty-nine. So pleased that you found us and that you enjoyed your visit. The LPL staff welcomes more than 50,000 visitors each month and we are happy you were one of them. We are very proud of our quilt. The squares were pieced and quilted by Longmont citizens and library staff. Each square along the border is significant in our town. The names of these blocks, starting from the top left corner and proceeding clockwise are: Library Hall, Wheat Field, Japanese Lantern, Goose Galore, Wild Goose Chase, Carnegie Library, Railroad Crossing, Old Country Church, Colorado Beauty, Sister’s Choice, Indian Puzzle, Airplane, Longmont Public Library, Longmont Public Library – 1972 building, Delectable Mountains, Watermill, Twin Sisters, Pumpkins, Mexican Cross and Turkey in the Straw. 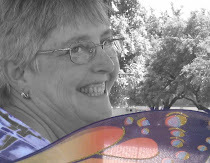 Please say hello next time you are passing through – Judith Anderson, Library Director. I liked your city very much, and will certainly visit your library if I ever get back. I loved all the public art projects. My wedding weekend schedule didn't let me get to the museum, but I've enjoyed the link to historic photos on your library website.